What is tooth abfraction and how it can be fixed with a filling. 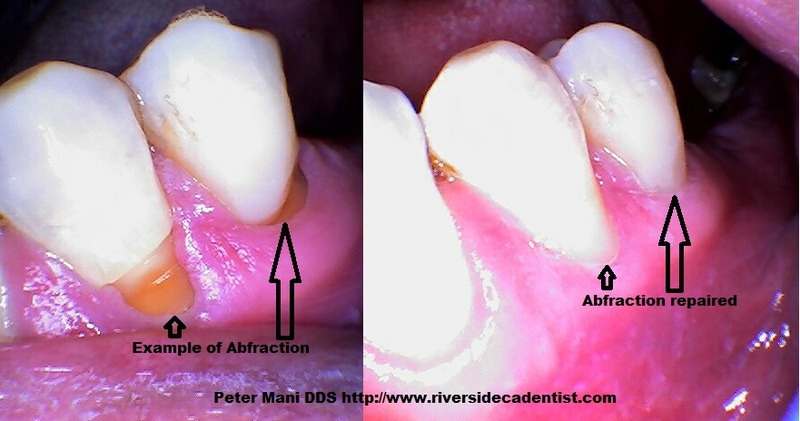 An example of tooth abfraction restored by Peter Mani, DDS General Dentist in Riverside CA. What is tooth abfraction? It is when the neck of the tooth gets worn away. What causes tooth abfraction? It is often caused by brushing too hard, or brushing with a hard tooth brush. It is often associated with gum recession or comes with gum recession. However a more common cause of abfraction is tooth grinding. When people grind their teeth, a lot of force is exerted down the tooth. Pieces of enamel chip away at the weakest part of the tooth where the enamel meets with the root (the neck of the tooth). Some times abfraction can cause tooth sensitivity because the root surface of the tooth becomes more exposed to hot and cold. So what can be done to fix abfraction? The easiest way is to first prevent what is causing it. Then repair them with tooth colored composite fillings. Above is an example of a patient who had abfraction. We were able to repair it with composite fillings. Photo of actual patient of Peter Mani, DDS general dentist in Riverside, CA. Photo used with permission and consent of patient. If you believe you may have tooth abfraction and would like to get your teeth repaired. Give Peter Mani, DDS a call at 951-687-8700. Denti-cal dentists in Riverside CA can now offer more services to adult patients. In case you did not hear, Medical / Dentical and even IEHP has reinstated some adult services. Back on May 1st, 2014, some of the services that have been reinstated. Denti-cal dentists in Riverside CA and throughout the state can now offer procedures including Exams, xrays, cleanings, fluoride treatments , fillings , root canals on front teeth, full dentures (not partial dentures) , full denture relines (not partial dentures), and extractions. That is great news for those of you who recall when adult services were taken away in 2009. Although it is not a full reinstatement of procedures, it is better than nothing right? We have been treating denti-cal / medi-cal patients in the Riverside CA area for almost a decade. If you are in the Riverside area including Corona, San Bernadino, Moreno Valley, or Perris and you have denti-cal, give us a call and we would be glad to help explain in more detail. Our office phone is (951)687-8700 or you can call denti-cal directly at (800) 322-6384. We are proud to be one of few denti-cal dentists in Riverside CA. An example of a wisdom tooth we extracted in our office. Wisdom teeth can often be problematic. Wisdom teeth are usually the last molars to develop. Often times they will not even erupt from the gums until the patient is over 18 years old. Depending on how the jaw develops and or grows, sometimes there is not enough room for the wisdom tooth to come out. If a tooth is stuck underneath gums it is considered an impacted wisdom tooth. When a wisdom tooth is impacted the patient usually will need to see an oral surgeon to get it removed. We can determine whether or not your wisdom teeth need to be removed, and if you need to see an oral surgeon or not. Some problems that impacted wisdom teeth can cause include crowding of front teeth, damage to 2nd molars, inflamed gums and more. The above photo is an example of a horizontally impacted wisdom tooth extracted by Peter Mani, DDS. This is not a usual procedure done by a general dentist and if you have a horizontally impacted wisdom tooth, you will usually need to be referred to an oral surgeon. (xray of actual patient of Peter Mani, DDS, used with permission and consent of patient). If you have a wisdom tooth you would like to have examined, and you live in Riverside, CA. Give us a call at (951) 687-8700 to schedule an evaluation of you wisdom teeth. We use toothpaste everyday to keep our teeth clean. But here are 15 other uses you can use toothpaste for that you probably didn’t know about. According to wonderful engineering, toothpaste can be used as a jewelry cleaner, stain remover, shoe shiner, nail hole remover and much more. The most important thing though is to help keep your gums teeth clean and healthy! Please read our previous blog post about how to help keep your gums healthy. According to this article from about.com, there are many good reasons to get your teeth cleaned. The most important one mentioned, in my opinion, is to prevent gum disease. Many people have gum disease but don’t even know it because gum disease is often painless. Gum disease is caused by the bacteria in our mouth. When that bacteria eats left over food, its by product is plaque. Plaque is that white film you can scratch off your tooth with your finger nail. If you have plaque, it is important to clean that stuff off by brushing and flossing. If you leave plaque alone, over time it will become tartar, also known as calculus. Tartar is basically calcified plaque. Once tartar forms it is nearly impossible to get it off at home. Don’t try to remove it at home. By getting your teeth cleaned at least every 6 months, it will help prevent you from getting gum disease. Consumer reports released a video today on how to choose the right toothbrush. When it comes to dental health, brushing your teeth at home is probably the most important thing you can do. You can come to the dentist every 6 months and get your teeth cleaned but if you don’t brush at home, you will most likely have gingivitis, gum disease, or other dental problems. Some key points that we agree with include: Use a soft tooth brush, brush at least twice a day, and make sure you brush for approximately 2 minutes. If you follow those steps you will likely be able to keep your teeth healthy. Using a curved handle manual brush will often allow you to brush hard to reach areas and behind teeth. Staggered toothbrush bristles will also allow you to reach areas a straight bristle brush wouldn’t get. The main thing is that you brush thoroughly and regularly. About the author: Peter Mani, DDS is a dentist who is in general practice in Riverside, CA. He has over 12 years experience in the dental field.